I’ve known a few people throughout my life that have chosen to end things by way of suicide. It’s always something that leaves you wondering–what was so awful that this person felt they had to take thir own life? Some times you get an explanation via something like a suicide note, but I don’t think the reasoning is ever as involved as it was in Thirteen Reasons Why. Hannah Baker was your typical high schooler, until she didn’t show up at school one day. Only later did her peers discover she’d killed herself. Clay Jensen, the narrator of Thirteen Reasons Why, had worked with Hannah at the local movie complex. The two were friendly with one another and even made out at a party one night, but it’s been weeks since Hannah’s suicide and Clay has been getting back to his normal routine. All that changes when he comes home from school one day to find a package waiting for him. What he discovers are a bunch of cassette tapes–recordings Hannah made before her death to explain why she felt suicide was the only way out. Clay can’t tear himself away from the tapes. It becomes clear from the beginning that only those who are mentioned as one of the thirteen reasons why Hannah chose her fate are the ones being given these tapes, and Clay is anxious to know what role he played in her death. As he listens to the tapes on a walkman, he wanders around the neighborhood following a map that locates all the areas that Hannah references in the tapes. I said in my Sunday Salon post this past week that I found this book slow going at first. I know that it’s had rave reviews and I expected to be drawn in right away–maybe that was the problem, in fact. My expectations were too high. I found myself getting more and more involved though as the story progressed. By the end, I was intrigued. I liked how the story weaved together to a climax, which wasn’t obvious at first. I didn’t necessarily expect there to be a cusp–more just a laundry list of reasons why Hannah chose death. I will admit Hannah was a character I didn’t really like. That seems heartless really, given the circumstances, but it’s true. For one, I thought she seemed entitled and whiny. Yes, she had some really difficult things happen to her–who doesn’t? And then she felt the need to involve people after the fact. There were some people on the list that deserved a guilt trip–that I won’t deny. There were others though, such as Clay, who really shouldn’t have had to deal with the heartbreak all over again, now made to be a million times more personal. In the end, I felt that Hannah took the easy way out and tried to bring others down with her. As a whole, I appreciated the story and the intent, but I had a hard time sympathizing with Hannah personally. 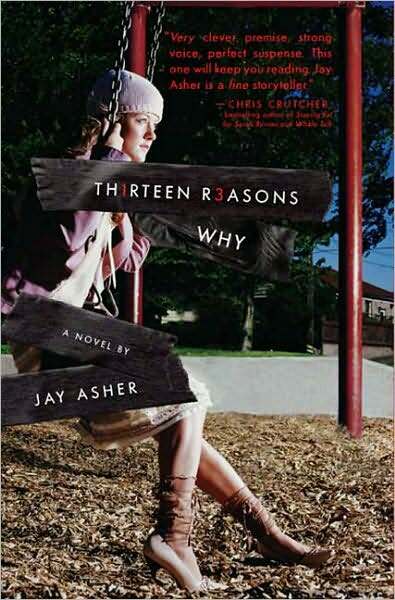 Overall, Thirteen Reasons Why is a great book, although it has many triggers. I think that it would be something that teenagers could empathize with. I don’t think I have been this freaked out by a book in a long time. Just looking at the cover scares me a little bit. Life as We Knew It is YA dystopian fiction at its best. Miranda is 16 years old and in high school when her life changes forever one day. An asteroid is projected to hit the moon one night–this is not an odd occurence generally, but the asteroid is believed to be large enough so that it will be visible to the naked eye. Thus, Miranda, her family, and pretty much everyone else has decided to watch the asteroid hit the moon. What they witness is stranger than anything that had been predicted or anticipated–the asteroid knocks the moon towards the earth, so that the moon is off course. So now the cover makes sense. But what other ramifications would this have, you may ask. Oh, if you only knew! Straight away coastal towns start flooding. The moon controls the tides, and with the moon knocked off kilter, the tides are completely wonky. If you live in a coastal town, you’re as good as dead. And it only gets worse from there. Other natural elements starts acting up–volcanoes are erupting, temperatures are cooling drastically. The world is suddenly in panic mode and everyone is fending for themselves. As the book continues, people are becoming shut off from one another and everyone is struggling to provide for themselves. It becomes dangerous to go into public for fear that you may be robbed or worse. Electricity becomes a thing of the past and as it gets cooler, the possibility of freezing to death becomes inherently real. And yet, Miranda still keeps some semblance of normality. She attempts to continue with her schooling. She still gets typical teenage crushes. 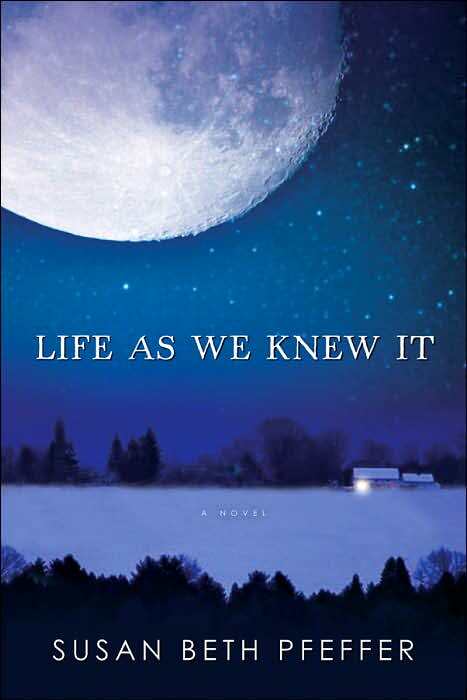 Life as We Knew It is basically a novel about how adaptable people can become when faced with adversity. I kept thinking as I was reading Would I have done that? or Would I have reacted that way? A situation like this seems impossible to fathom, and I can only believe that I would not have half the strength of Miranda and her family if I were faced with a similar situation. Life as We Knew It really is a downright depressing read. Yes, you can get hope from the perseverance displayed by Miranda and her family, but that still can’t make up for how distraught this book made me feel. Which is not a bad thing at all, don’t get me wrong! But for anyone who has yet to read this book, be forewarned. If you are a fan of dystopian fiction, this is a must read. As I anticipated, this week was somewhat slow for me. I was reading Sylvia’s Lovers, by Elizabeth Gaskell, for the Classics Circuit. Classics always take me longer to read, and at 500 pages, it took me six days to read this one. I finished it last night and moved on to Speak, by Laurie Halse Anderson. I just finished that moments ago, so that leaves me with two books this week, which is pretty average. My review on Sylvia’s Lovers will be posted a week from tomorrow and my review on The Woman in White, by Wilkie Collins (also for the Classics Circuit) will be posted on Black Friday, so watch for both of those. I have been feeling a bit overwhelmed recently by both my review copies and my library books. I have 20 review copies and 17 library books to read right now. Because both piles are beginning to stack up, I have decided to devote the next two weeks to only review copies and library books. Which means I will not be reading any Bookswim books or any books that I own. Speak was from the library, so it was nice to knock out one library book this morning. It is hosted by J Kaye’s Book Blog and the info can be found here. I will be going for the Stepping it Up level, which is fifty YA novels. I think that is doable in a year’s time but we shall see. I have also signed up for the 2010 challenge at Bart’s Bookshelf. The goal is to read two books from each of ten separate categories. The categories are as follows. *** Bad Bloggers: Is hosted by Chris of Stuff as Dreams are Made on. The requirements for this category are up to you! Want to challenge yourself to read some graphic novels? A genre outside your comfort zone? Something completely wild and wacky? Then this is the category to you. The only requirement is that you state it in your sign-up post. As for current challenges, I am officially dropping out of the Fall into Reading challenge. Why, you may ask. Well, it has been over two months, with one month left in the challenge, and I still have not read one single book on my list! Pretty pathetic! As for today, I hope to get some reading done but there is quite a bit of laundry and other chores that need to be done. I am not too worried because I should get a good amount of reading done this week anyway, with Thankfully Reading coupled with the fact that I will have a lot of time off of work for the holiday. What do you plan on reading today?